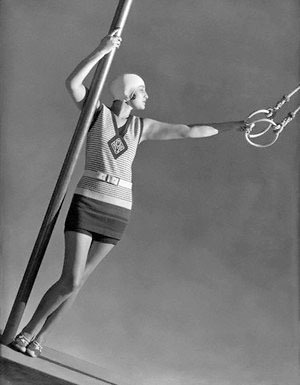 Wool jersey swim suit, 1928. 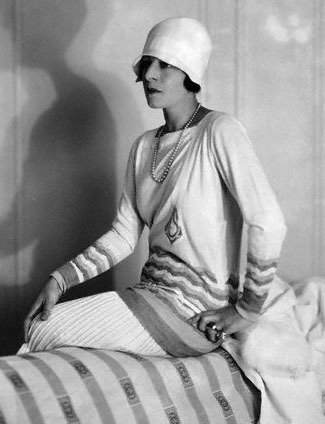 Jean Patou is considered the first real designer of women’s sportswear. He combined austere silhouettes with comfortable cuts. 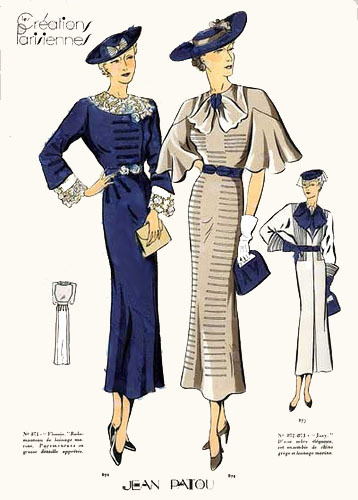 He created his clothing for the healthy and active women of the 1920s. He was responsible for the popularity of knitted wool jersey swimsuits and simple cardigans. Many of his clothes also bore his monogram, years before that kind of fashion branding became popular. Jean Patou had been active in fashion since 1907, owning a small boutique. His career was then interrupted when war broke out. In 1919, after returning from service he founded his couture house and its inaugural collection was an immediate success. 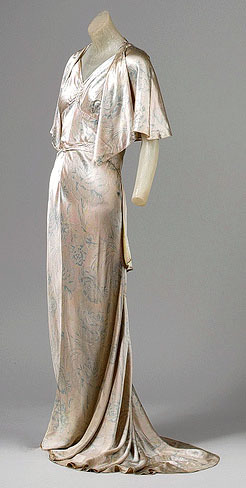 Printed china silk gown, 1931. Patou always felt that his real adversary was Coco Chanel. During their long rivalry, Patou raised the waistline in 1929 to its natural level and lengthened skirts after viewing a new collection by Chanel. In 1932, he then lowered the waistline again. Page of Les Creations Parisiennes magazine. 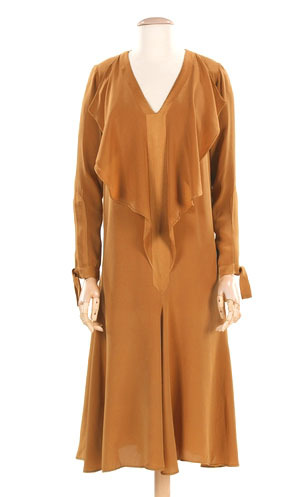 Patou would create so many clothes each season that he would need to show his huge collections in two parts. The morning sessions were devoted to sports clothes and beach pajamas while the afternoon would be focused on formal day and evening clothes. He specialized in tennis clothes, dressing famous tennis player and Wimbledon winner Suzanne Lenglen, on and off the court. In 1925, he opened the Sports Corner where he presented his sportswear collections. Each room in the Sports Corner was devoted to a different sport such as tennis, golf, or skiing and all the clothing could be coordinated with accessories like scarves, gloves, and caps. 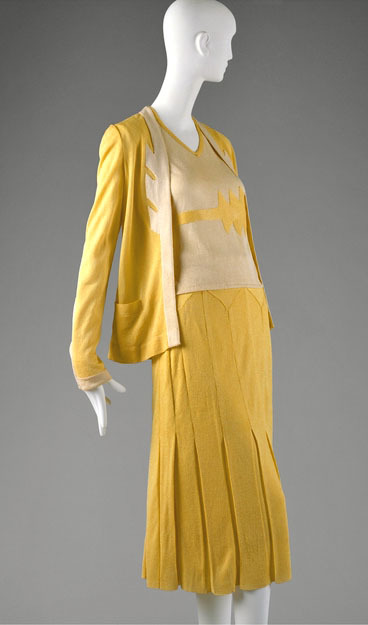 Silk cardigan and skirt, 1927. Some of his most popular looks were pleated straight silk skirts worn with white cardigans. Even though he believed in strong lines and clear colors, he used beige as a base color. Sometimes he utilized folkloric embroideries and Art Nouveau geometric designs on his garments. Other popular garments were his “cubist”-inspired color-blocked sweaters. Hollywood Connection:Designed for clients, such as actors Mary Pickford and Pola Negri. 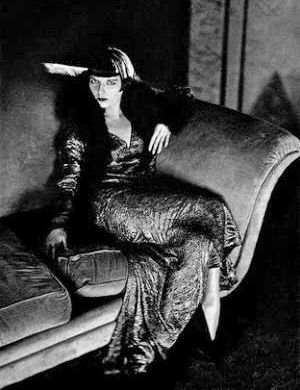 He also designed costumes for French films, such as Beauty Prize (1930) where he dressed the American actor Louise Brooks. 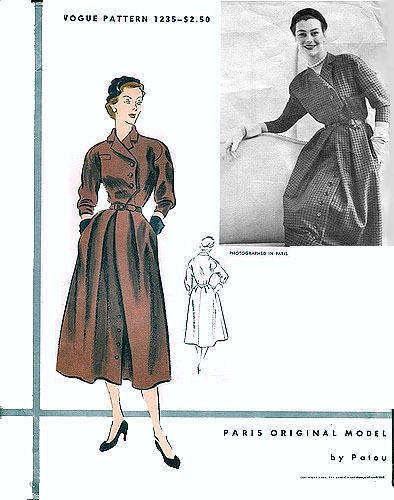 Home Sewing Connection: He designed patterns for the Vogue Paris Original Model collection. 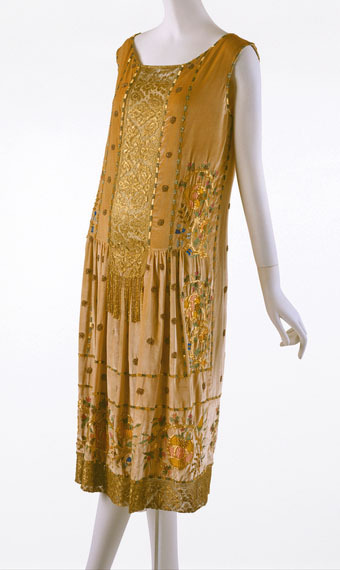 Beaded silk evening dress, 1925. Patou would create a new fashionable color every season, Patou blue, dark dahlia pink, etc. He also created his own patterned fabrics. He launched the first suntan oil, Huile de Chaldée, in 1927. Years later, his rival Coco Chanel released her own version. Patou was the creator of Joy perfume, long time considered the most expensive fragrance in the world. Joy was named the “Scent of the Century” by the Fifi awards in 2000, beating out Chanel No. 5 and Anaïs Anaïs. He was the first European designer to use professional American models to show his clothes. Sources: Couture: An Illustrated History of the Great Paris Designers and Their Creations(1972) Ruth Lynam; Fashion: The Century of the Designer, 1900-1999(1999) Charlotte Seeling. I love that there was such a thing as day dresses…goes to show you that there was a much more leisurely approach to clothes then there is now. I also like the knitted bathing suits. I’m always, always fascinated by these even if I might not wear them! I’m tempted to knit one just for the heck of it.